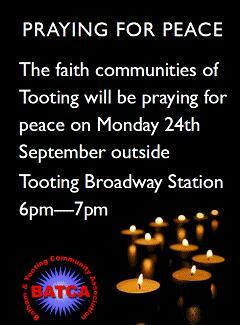 Peace Ceremony on Monday 24th September 6-7pm at Tooting Broadway tube station. Please join BATCA’s sixth Multi-Faith Peace Ceremony to be held from 6-7pm on Monday 24th September outside Tooting Broadway tube station. This is an occasion that celebrates the richness of our community and its faith traditions. Leaders from the Buddhist, Christian, Hindu, Jewish, Muslim and Sikh faiths have been invited to say brief prayers for peace. We have asked our Mayor and MP, and other local leaders, to come and say a few words. Members of the public will be invited to light candles, creating a glow in the falling light, and if they wish, express their own thoughts or prayers for peace. Please support this moving occasion, and forward the flyer widely. This entry was posted in London, Olympic Truce, Peace-building, Wandsworth and tagged BATCA, Tooting by Catriona Robertson. Bookmark the permalink.